Clashes erupted in Istanbul as Turkish police used tear gas and water cannon to disperse a rally commemorating the iconic police brutality victim Berkin Elvan. The teen was fatally wounded by police in an anti-government protest at Gezi Park in 2013. 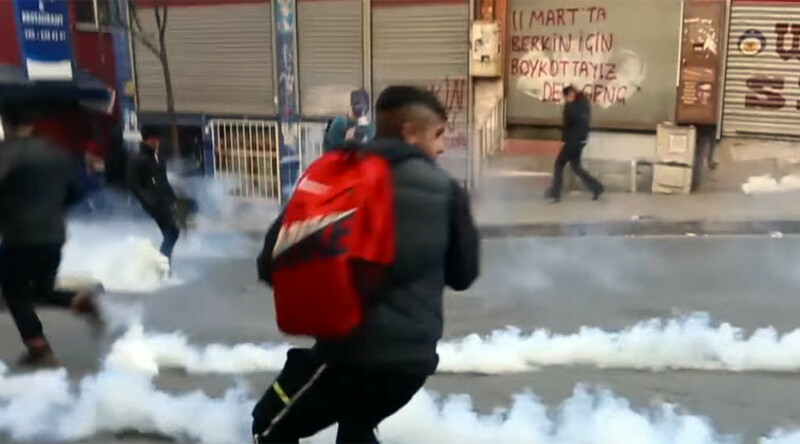 Hundreds of activists were filmed throwing rocks, petrol, and smoke bombs at riot police on Friday in Istanbul’s Okmeydani district, from which the slain 15 year old came. Elvan was hit by a tear gas canister hurled at him by a police officer during mass demonstrations against then-Prime Minister Recep Tayyip Erdogan at Istanbul’s Gezi Park in June of 2013. Some 200 people also reportedly gathered at the cemetery where the boy was buried to honor Elvan’s memory and demand that the truth about the incident be unveiled. The investigation announced in March that, based on camera footage, it had finally identified the police officer whose actions allegedly caused the teenager’s death, Turkish Milliyet daily reported. The suspect is supposed to testify at the trial. Erdogan has gone as far as to link the teen to terrorist groups. The allegation has been rejected by his parents, however, who say the boy was on his way to buy bread from a nearby shop when the tragic incident occurred. The teen died in March of 2014 after spending 9 months in a coma. Elvan’s death sparked nationwide unrest across Turkey, as his name became a symbol of police brutality. At the time, protesters chanted slogans such as “Tayyip! Killer!” and “Everywhere is Berkin, everywhere is resistance,” pointing to the Turkish government’s complicity in the teenager’s death. The 2013 anti-government protests started on May 28 and were initially directed against PM Erdogan’s plans to redevelop Gezi Park by building a shopping center there. Excessive force employed by police led to 11 deaths and left thousands injured. A wave of demonstrations subsequently took place across Turkey, many of them resulting in violent confrontations between protesters and law enforcement.